I received a phone call from a man, now retired, who owns properties. He knows about the waking dream and wanted to share a series of experiences, all of which involved damage being done to his buildings by flooding water. As we talked, it became clear that he not only understands the concept of the waking dream in general, but he also has a thorough grasp of the meaning of his own waking dream. Instead of wanting a better understand of what his dream was trying to tell him, his real question was what changes he needed to make within himself in order to put his own out-of-balance situation back into balance. This enlightened approach to responding to a dream message is one we will focus on this week. We will try to answer the question: If you have a dream and you understand what it is telling you, then what do you do about it? First the waking dream itself. I own buildings and I manage them. 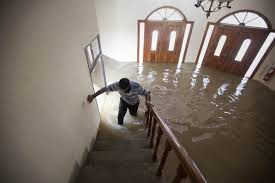 Over the past couple of years I have had easily a dozen or more instances where water has gotten into the buildings in one way or another, and has caused flooding. Altogether, these various incidents have cost me in excess of $250,000. Sometimes, it has been a breakdown of plumbing. Once there was a huge rainstorm and the exterior drains were clogged and didn’t work. Other times the source has been a complete mystery. For example, once I found water all over a really beautiful hardwood floor, and there were no broken pipes. No one had left a faucet on, and nothing was wrong, except that the floor was in danger of being destroyed. In that instance, my girlfriend called a guy who specializes in catastrophic home cleanups. He was there in less than an hour with all his equipment. Very soon, he had the water removed and we put a dehumidifier in the room which continued to take the excess moisture out of the air and out of the flooring. As I stated above, this week we are more interested in how one responds to a dream message than in the process of interpretation itself. So I will now offer the interpretation we arrived at without going through the various steps. For this dreamer, water symbolizes life—even an elixir, like spirit itself. This elixir is pouring into all of the areas where the dreamer “dwells” (his buildings). Sometimes the outlets for processing this elixir (plumbing) aren’t working well, especially the part of himself that deals with the excess and waste. This has now even affected a part of him that is beautiful, that communicates a sense of nature, has a nice appearance and feels warm (hardwood floor). But his feminine self (girlfriend) calls on the part of him that is in charge of restoration. Soon, with special equipment, the excess is removed, and a degree of normalcy is restored.